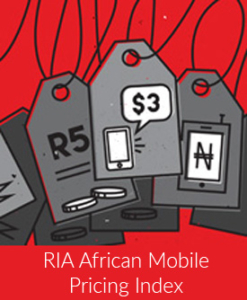 With the mobile termination rate (MTR) enforced at 20c by the Courts last March the battle for airtime sales has shifted into a full-scale price war significantly improving South Africa’s ranking on the Africa Price Transparency Index. MTN SA, previously the most resistant to pricing pressure from upstart Cell C, has now taken them head on. After their previous strategy cost them a million subscribers in their last financial year, they have came out in the second quarter of the year with guns blazing. Matching and beating Cell C’s lowest price they intensified the sector trend towards bundled and dynamically priced products, identified by RIA’s policy brief in the previous quarter. MTN SA maintained their Sky Bundles and Cell C its Infinity packages. MTN SA, in their strategy to retain prepaid customers in the lower end of the market, introduced two new daily bundled offers: MTN Sky Daily, MTN Sky Unlimited, MTN to MTN daily. What’s new in the South African market? MTN Sky daily costs R79 per day and provides unlimited calls, 400 SMS and uncapped (20MB) data. 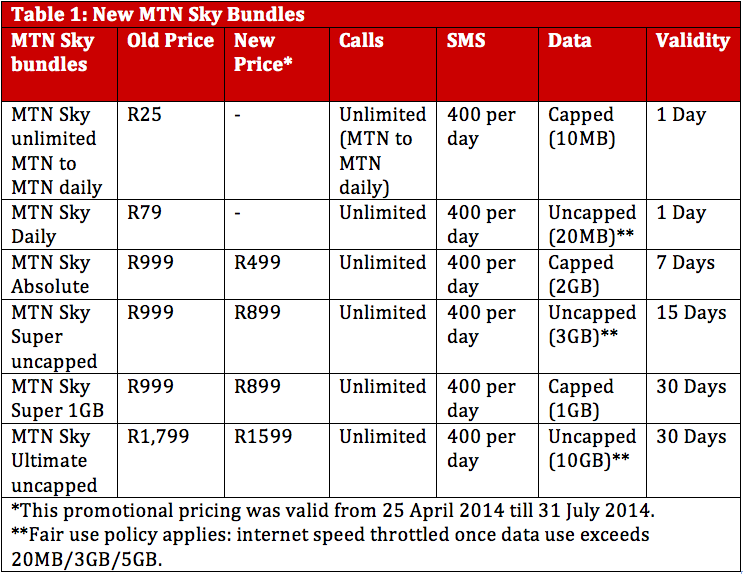 In contrast to MTN’s other offerings valid for longer than a day, the data is quite restricted. MTN Sky unlimited MTN to MTN daily costs R25/day for 400 SMSs, 10MB and unlimited on-net calls daily. The MTN Sky MTN to MTN daily package was found to be the cheapest prepaid package on the market at an OECD (2010) basket price of R772 including off-net call rates. Apart from the introduction of new products, MTN SA reduced the prices on its existing Sky bundle packages. However the price reductions were listed as promotional until 31 July 2014. Despite the significant asymmetry in termination rates now between the incumbent mobile operators (20c) and the later entrants at 44c, Cell C has retained their simple flat rate strategy and did not launch differentiated off-net and on-net prices. Telkom SA’s higher priced off-net calls and lower priced on-net calls, introduced in the third quarter of 2013, took advantage of the 40c asymmetrical termination rates set in March 2013 and have remained the same since then. From a benchmarking perspective, a reduction in termination rates brings the South African MTR closer to some of the lowest termination rates on the continent which have resulted in major retail price reductions. The difference in MTR amongst those countries that have introduced MTR cuts is diminuishing as they cluster between 1 and 2 USD cents suggesting that they are getting closer and closer to being cost based. As a result, Ghana and Kenya 2010 OECD baskets are placed second and sixth on the prepaid mobile pricing index (see Table 3 below). MTN SA and Cell C customers in particular benefitted from reduced tariffs. MTN SA introduced the R0.79/minute flat rate that is now a permanent voice tariff and also launched a promotional tariff of R0.01 per second. Vodacom introduced a similar tariff but the product was not found as a stand-alone tariff in Q2 2014 as it can only be added on to existing subscriptions. Cell C reduced its on-net and off-net tariffs to R0.66 per minute. Conversely, Virgin Mobile (at R0.99) and Telkom SA (at R0.29 on-net and R0.75 off-net, the lowest per-minute charges of an operator) did not respond to the changes in MTRs in the market. Although there were significant price reductions in the South African prepaid mobile voice market, the cost of the cheapest South African operator’s (Telkom Mobile) basket price did not change between Q1 2014 and Q2 2014. 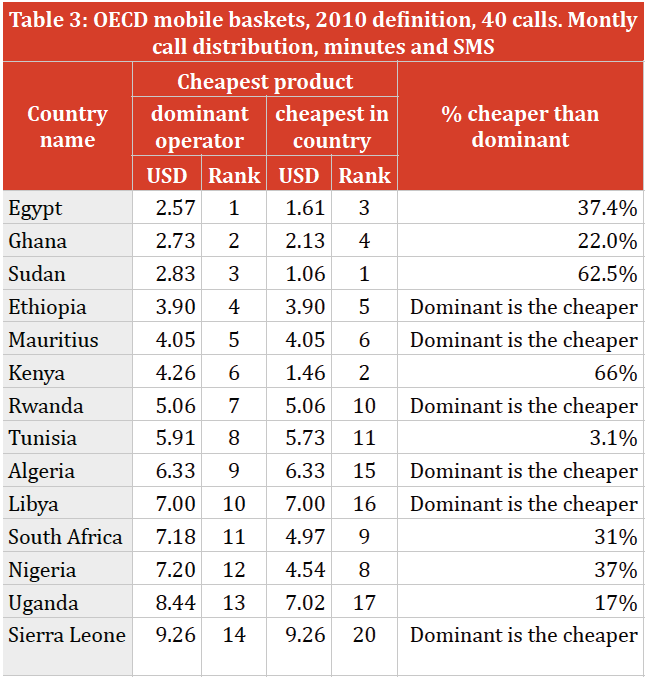 This price is 4.5 times more expensive than the cheapest product in Africa and almost twice as expensive as the cheapest product available from a dominant operator in Africa (Vodafone Egypt has a basket price of USD2.57 and a very innovative build-your-own bundle product; see Table 3 or Figure 1). 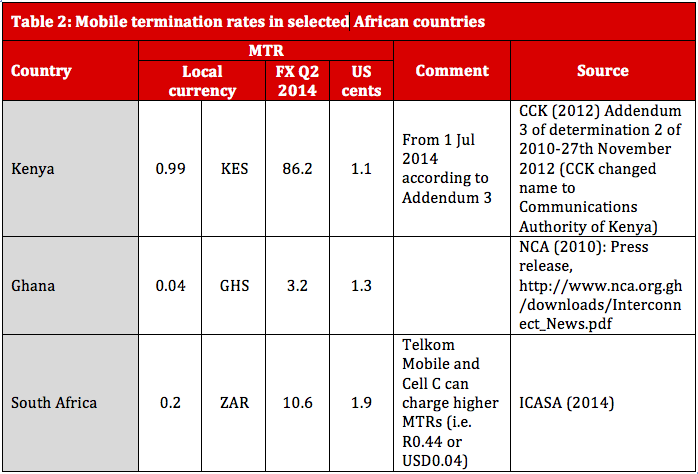 Figure 1 compares the cost in US dollars of the cheapest prepaid mobile product available in South Africa with that available in all of Africa. (The comparison is based on the internationally recognised 2010 OECD 40 calls/60 SMSs basket, between Q4 2010 and Q2 2014). 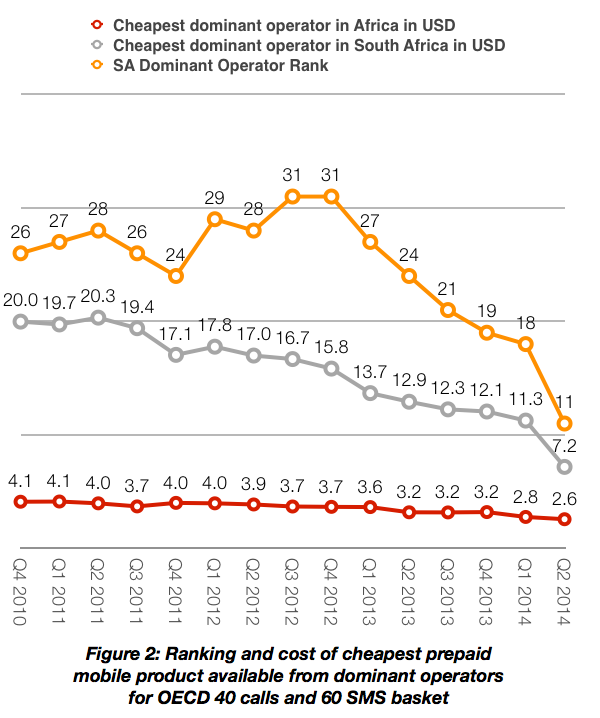 On the Cheapest Prepaid Mobile Voice Product Available in the Country sub-index, South Africa shifted down one position to 9th in the second quarter of 2014 from eighth position in the first quarter of 2014 (Figure 1). This is not a significant difference and it is explained by the depreciated value of the Rand. On the price of the dominant player in the market sub-index (which affects most people) South Africa ranks 11th which is significantly up from the previous quarter, when it ranked 18th (Figure 2). The improvement of South African position is the result of a full-scale price war which led to the introduction of the 1c per second promotional tariff by MTN. In brief, the gaps between best performing African countries on the two rankings and South Africa is narrowing, suggesting that South African prices are moving in the right direction. The detailed rankings for all countries for Q2 2014 is displayed in Table 3 below. 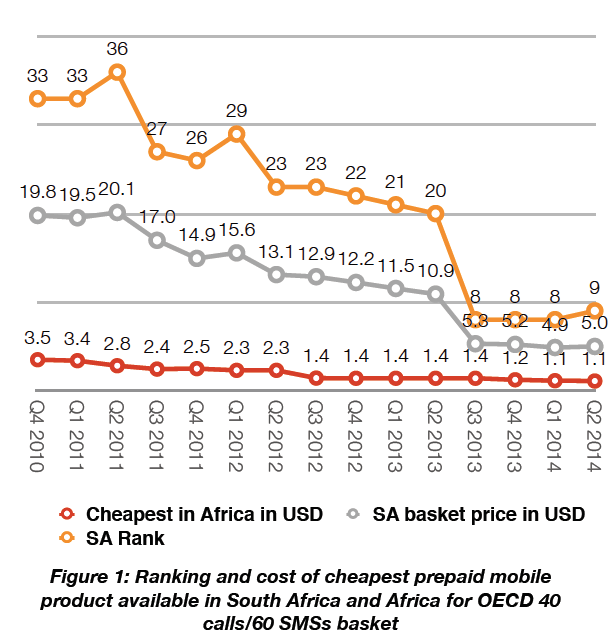 Figure 3 below compares the cost of the cheapest prepaid mobile products for each mobile operator in South Africa according to the OECD 40 calls/60 SMS basket. 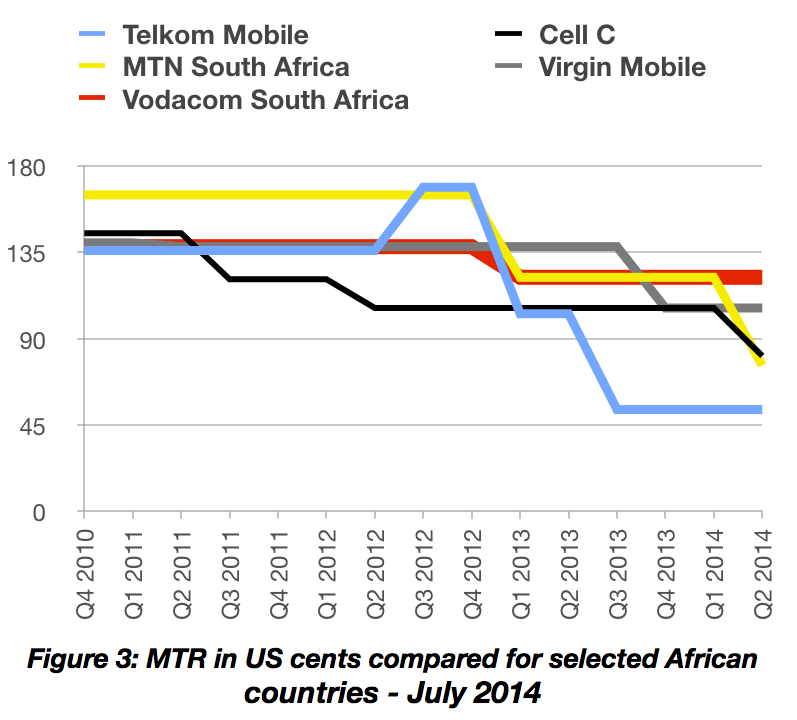 Despite the introduction of new tariffs from Cell C and MTN SA, Telkom still has the cheapest product in the market. Its price of the Sim SONKE product remains only R0.29 per minute for on-net calls and R0.75 per minute for off-net calls (including calls to fixed lines). MTN SA is now the second cheapest operator following the introduction of the R0.01 per second tariff, offering a flat rate set at R0.60 per minute. As this is a promotional product valid until 31 August 2014, this is included in the index until the promotion expires. The significant gap between the cheapest product from dominant operator (MTN SA) and the cheapest product in the country (Telkom Mobile) suggests considerable pricing pressure on dominant operators. In Q2 2014, Cell C introduced the R0.66 permanent flat tariff across all networks. Vodacom SA maintained its R0.02 per second call rate, making it the most expensive network provider of prepaid mobile voice services in the South African market. However, quarterly financial results for Vodacom SA’s Q1 of the 2014 financial year revealed that in order to reduce churn rates, Vodacom SA has embarked on a “price transformation strategy” which cuts the overall effective voice price per minute by 25.3% to R0.68. This reduction has been accompanied by an increase in outgoing calls of 26.1%, thereby offsetting any losses resulting from the price reduction. The MTR cut did not result in across-the-board price reductions. Subsequent jostling in the prepaid market took place mainly in the midfield. MTN SA’s pricing strategies were directed at retaining voice customers and regaining customers lost to Cell C aggressive pricing, while capturing new ones in the data market. While Telkom Mobile is still the cheapest mobile voice operator, MTN SA is now the second cheapest operator before Cell C.
Nevertheless, South Africa’s performance on the Prepaid Mobile Price Transparency Index based on the OECD’s baskets did not change and the country remains relatively expensive compared to other African markets.